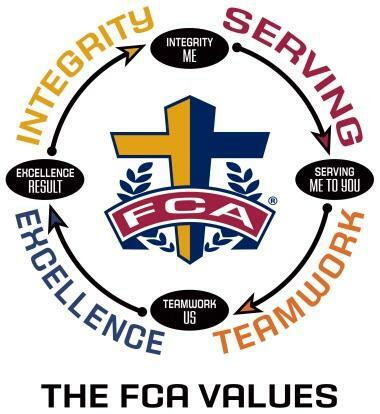 The Fellowship of Christian Athletes (FCA) is touching millions of lives… one heart at a time. Since 1954, the Fellowship of Christian Athletes has been challenging coaches and athletes on the professional, college, high school, junior high and youth levels to use the powerful medium of athletics to impact the world for Jesus Christ. FCA focuses on serving local communities by equipping, empowering and encouraging people to make a difference for Christ. To develop relationships that will demonstrate steadfast commitment to Jesus Christ and His Word through integrity, serving, teamwork and excellence.